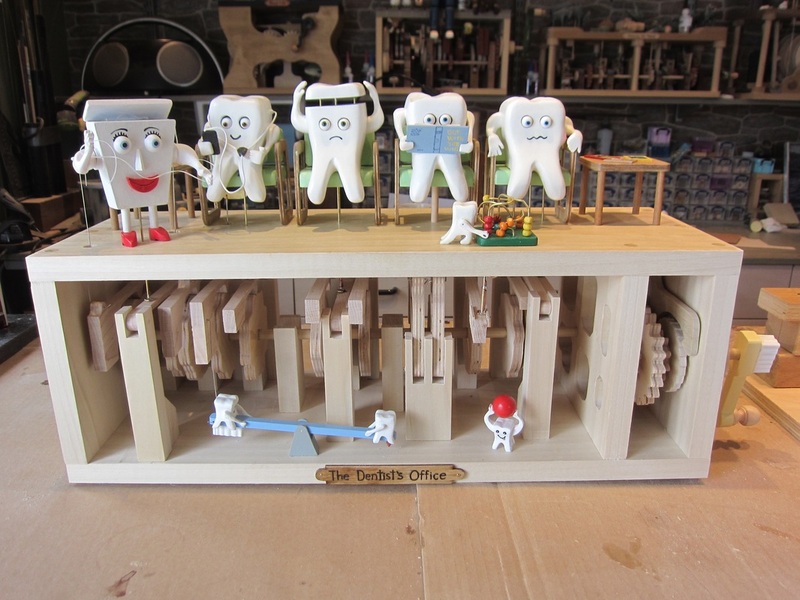 The Story of "The Dentist's Office"
This automata was inspired by the popularity of the "Waiting Room" a previous automata project of mine. Rather than recreate the same setting with different patients I chose to change the theme to that of a dentist's office. Dental problems are not as evident a physical ones so I decided to use teeth as the patients, not real people. So perched on those typically uncomfortable waiting room chairs we have several clients who need assistance. Waiting room to see the dentist is Abby Cess who suffers fram an accessed tooth, Phil McCavity who has a cavity that needs to be filled, Lucy Capp who has a loose cap, and Philip McCracken who has a cracked tooth. Philip, being the teenage hipster that he is grooves to the tunes on his smart phone while he waits. Phil has brought along some his own reading to fill his time. while Abby's son, Bicuspid plays on the floor with the traditional bead maze found in most medical waiting rooms. Unfortunately for the others Flossy Johnson, the local dental floss sales representative, has stopped by and never misses an opportunity to rant about the benefits of her product to a captive audience. Below baby teeth play on a toothbrush teeter totter while another excitedly hoists a red gum ball. She'll be a future patient for sure! I am often asked how everything works as people try to peer into the inner workings of a completed project. While many folks are fascinated with the story unfolding lots of others interested in how automata projects work. During the making of "The Dentists Office" I took a moment before I joined the top and bottom workings together to make a video of the mechanism elements as they relate to the motion of the characters. Here is a video tour of the project mechanism, I hope that the curious find it helpful to figure things out.